Shaker pegs on the inside and outside of each door provide a place to hang ornaments or candles. Build the project with either a towel bar or with display pegs as shown. Cabinets measure 16"H x 9-1/2"W x 4"D. Plan includes FULL SIZE patterns to build both variations shown. Order the #9770 Country Shelves Hardware parts separately. 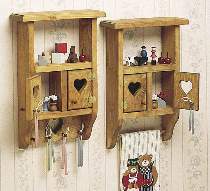 Country Shelves Hardware Parts includes hinges and screws, as well as enough mini shaker pegs and a wood dowel to build one country shelf in either version pictured. Order one package for each project you build. Project plan, wood and wood finish are not included.